Hello,knock knock-did any one miss me around?I know I've been away just for a while but it is not very often I disappear just like that:).Been down with viral fever and cough and feeling terrible.A fever does put you back into place,never have I felt so helpless,weak and miserable.Anyway,back to business now and the first thing I cooked after one full week is this simple Paneer curry. I love Sunday lunches,which mostly consist of a Biryani/Pulao,a Paneer curry or a Gobi Manchurian,lots of raita and lijjat pappad.This Sunday was no different.I resorted to a simple paneer curry,recipe courtesy my sis-in-law Soumya.Her dishes are always simple and delicious.She doesn't like to stick around in the kitchen much,so it is always short cut dishes without compromising on the taste. 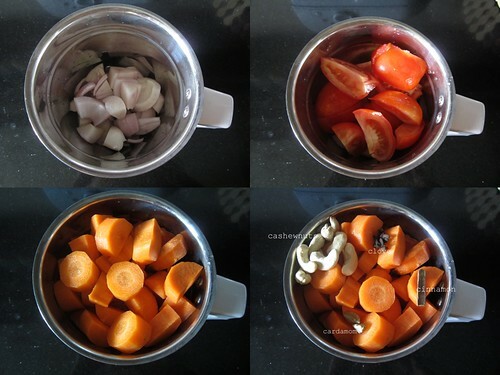 onions,tomatoes,carrots,cashewnut,cinnamon,clove and cardamom to a smooth paste by adding enough milk to ease the grinding process. In a non stick pan add ghee+oil and saute this paste for 5-7 minutes.If the paste is too thick,you can add more milk or hot water. Mix in chilly powder and salt to taste. Now add the peas(cooked for a minute in full power in the microwave)if using,shallow fried paneer and kasoori methi and let it cook for another 5-7 minutes. 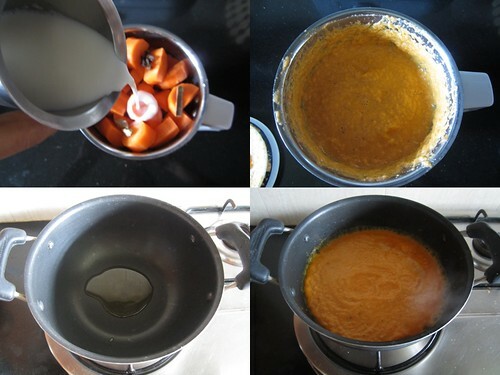 Adding carrots gives the curry a natural orange hue and a thick gravy.You can thin down the gravy using milk or water. 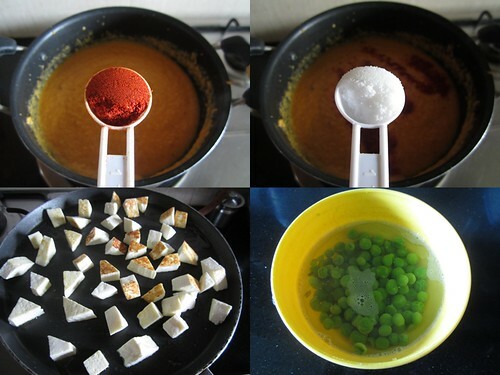 The curry can be made with paneer alone or can be combined with other vegetables like peas,capsicum etc. 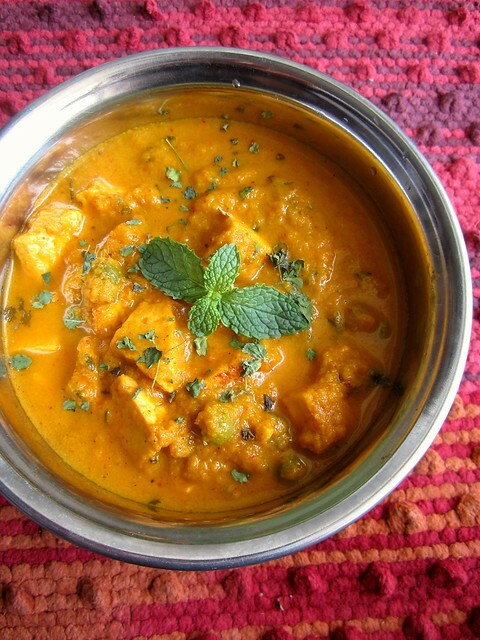 The gravy works well as a base for vegetable curries too. 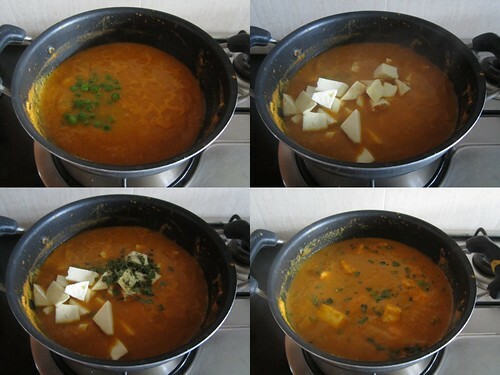 Hope you are feeling better now!curry looks colorful!addition of carrot is innovative! 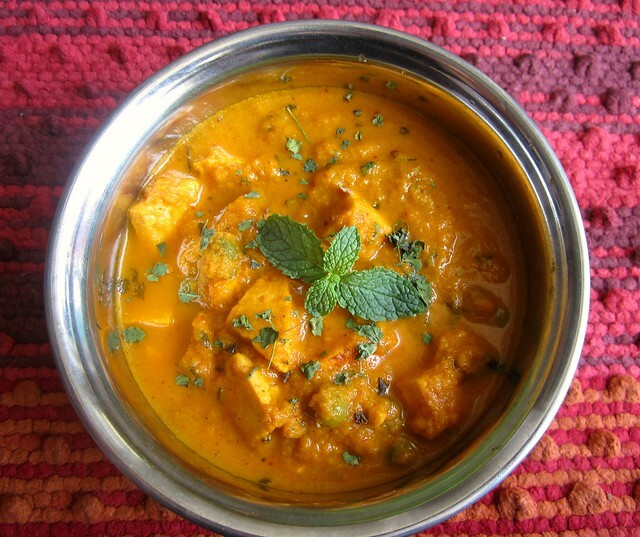 awesome delicious and droolworthy creamy paneer curry. Adding carrots is a lovely idea...love the creamy instant gravy!! Good one... grinding carrot is something new... the rice also looks very tempting! Welcome back Divya.loved the recipe.Will try it. The carrots to the gravy are a very good and healthy idea! wow..love this recipe..very well explained gear. looks yumm. hi divya... i followed your recipe y'day but used cauliflower and peas and it was really really good.... the addition of carrots to thicken the gravy was the best, I also added a small dollop of sour cream :).. thanks once again! Divya..I made this curry today for chapati..it came out really well. Thanks!! Yummy recipe..Let me try out.. I tried thsi recipe..came out very well.. Now i have started trying all yr recipes... Wonderful cook you are..
tried it...came out well...thanx a lot....amazing blog u have..
Hi Divya - My mom made this today. She omitted the peas and added mushroom. 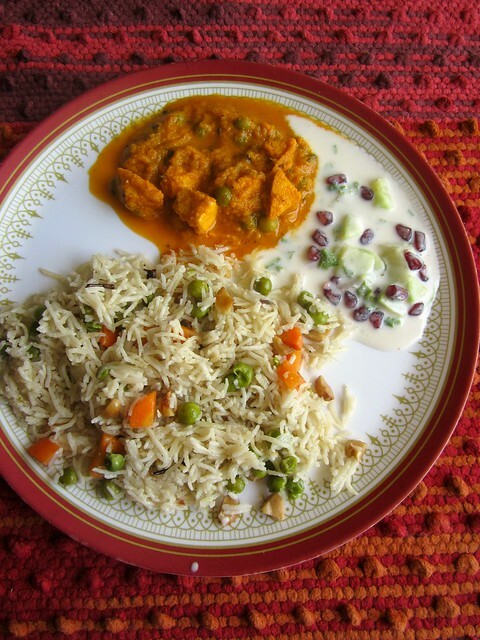 It tasted really delicious with basmathi rice. Will definitely send you the pic! Any nuts of your choice.Cashew is added for richness and creaminess.